Place all ingredients in blender. Cover and blend on medium speed about 30 seconds, stopping blender occasionally to scrape sides, until smooth. Cover and refrigerate at least 1 hour to blend flavors. 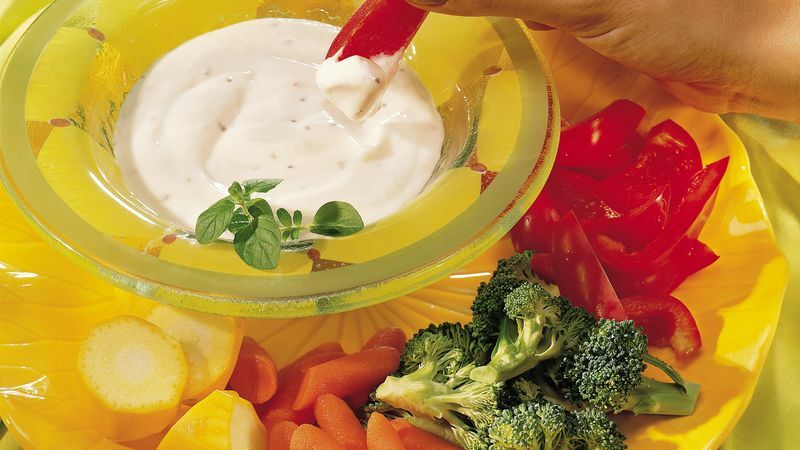 Serve dip with vegetables. Select colorful vegetables with great eye appeal to tempt your family to eat more vegetables. Pick a few family favorites. Good choices would be broccoli flowerets, cherry tomatoes, baby-cut carrots, snap pea pods and sliced yellow summer squash. When it comes to nutrition, yogurt has the advantage over sour cream. Yogurt is high in protein, calcium, potassium and riboflavin.